Non-Tax-Deductible Gifts, such as donations given as donor-directed gifts through a foundation or monies received from the sale of stock donations, can be entered on an individual’s giving record in such a way that will reduce the amount of a Pledge without displaying the amount as a tax-deductible charitable donation. In other words, the dollar amount will be reflected in the Pledge Amount Given on a Contribution Statement, even though the dollar amount itself will not be on the Statement. 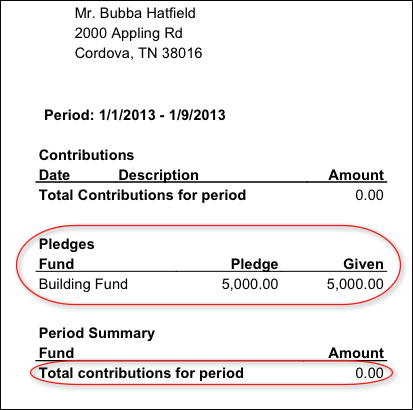 Bubba makes a Pledge of $5,000 to the Building Fund. Bubba has donated a boatload of money to Bubba’s Charitable Foundation. He directs the Foundation to make a $5,000 donation to the Building Fund on his behalf. This donation is entered on Bubba’s giving record as a Non-Tax Deductible gift. 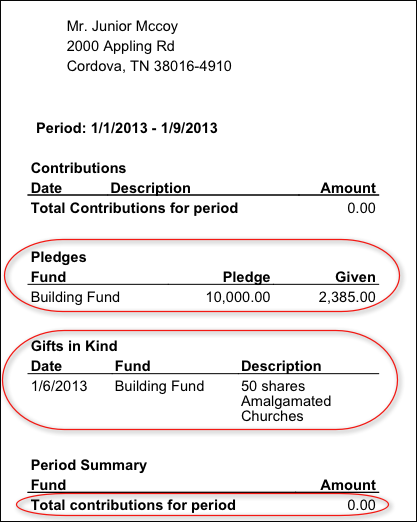 He received a tax receipt from the Foundation and should not receive tax credit from the church for this donation. His $5,000 pledge will display on his Contribution Statement (in the special section for pledges) and the Amount Given toward that Pledge will reflect the $5,000 given through the Foundation. By recording the donation to the Building Fund from Bubba’s Charitable Foundation on Bubba’s giving record as a Non-Tax-Deductible contribution, TouchPoint will reflect that amount as being applied toward Bubba’s pledge. However, the actual dollar amount of the contribution will not be listed as on his Contribution Statement. This section will show how a stock gift is recorded as a combination Gift-in-Kind and Non-Tax-Deductible gift. The first part records the gift (no dollar amount), and the second part records the sale (with a dollar amount). Junior makes a pledge of $10,000 to the Building Fund. He plans to use a gift of stock to satisfy part of his pledge. The church records his stock gift as a Gift-in-Kind at the time he gives it. The church later sells the stock. The amount received from the sale of the stock is recorded on Junior’s record as a Non-Tax-Deductible Gift to the Building Fund. This means Junior will not get tax credit for that dollar amount, but for the Gift-in-Kind (50 shares of stock). Junior is required by the IRS to compute the amount of his stock gift based on the value of the stock at the time of the donation. See below for further explanation. This Non-Tax-Deductible Gift will not display on Junior’s Contribution Statement (that is against IRS regulations), but his pledge will show that amount being given toward the pledge. In both of these cases, the IRS regulations have been followed, because neither Bubba nor Junior are being given a tax receipt from the church for the dollar amount of the donation. In Bubba’s case, he will see in the Pledge section of his statement, that he pledged $5,000 and has given $5,000. Junior, on the other hand, will see the Gift-in-Kind of 50 shares of Amalgamated Churches and will see in the pledge section his $10,000 pledge and that he has given $2,385 toward that pledge (which came from the sale of the stock). Both Junior and Bubba will NOT have these gifts included in their giving for the period on their Contribution Statements. These Non-Tax-Deductible donations will merely show as a reduction of the amounts of their pledges. The donor values the stock gift for their tax deduction purposes based on the fair market value “at the time delivery was effected” which would be on the date the donor relinquished control by having his broker donate the stock. Multiply the mean price times the number of donated shares.